I know people always want to know whartt horses to watch next in hopes of becoming great so here is a discussion about that. She really has "that look".....something about her and of course she is 4 for 4. 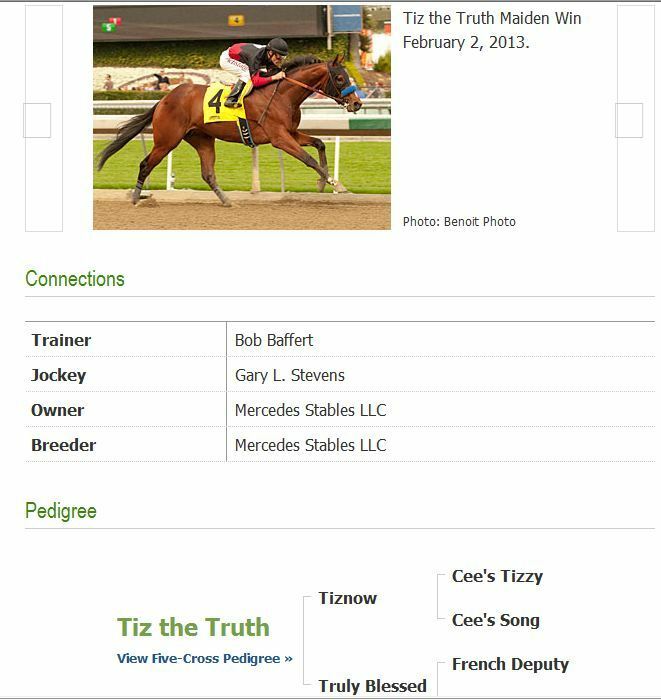 TIZ THE TRUTH looks like he is on the upward spiral! I like his pedigree for sure. Unbridled Forever. Unbridleds Song/Lemons Forever, is the talk of DRF, shes one to look out for as well. Her goal is the KY Oaks, which her dam won back in her hay day. Yup, i am watching him. Hes bred and owned by Lanes End and is trained by Shug, hes having a good year lol. i just have to point this out. Top Billing is out of Parade Queen who is by AP Indy, well Parade Queen is the dam of Untouched Talent who is the dam of Bodemeister!! This two year old filly has already showed her promise on the racetrack,taking the 33rd rendition of the G1 Hollywood Starlet Stakes in only her second start.This filly's pedigree is full of top class race mares bred to go distance.Her sire,Smart Strike,is an outstanding filly sire,most notably 2011 Breeders' Cup Juvenile Fillies winner My Miss Aurelia.Smart Strike's pedigree is full of some of Canada's best race mares.His dam,Classy N' Smart,was an outstanding race filly,winning five of her nine starts,including the Canadian Oaks.Classy N' Smart is also the dam of legendary race mare Dance Smartly,winner of the Canadian Triple Crown and Canadian Horse of the Year.Streaming's dam,Teeming,is a daughter of Storm Cat out of the Deputy Minister mare Better Than Honour,making her a half sister to the Belmont Stakes winning filly Rags to Riches.Keep an eye out for this blue blooded filly on the track next year! Here's one for the turf (impeccably bred, trained by Shug, owned by the Phipps - another Orb, but on turf?) who has shown both heart and talent. I'm sure he'll be racing down in Florida shortly. 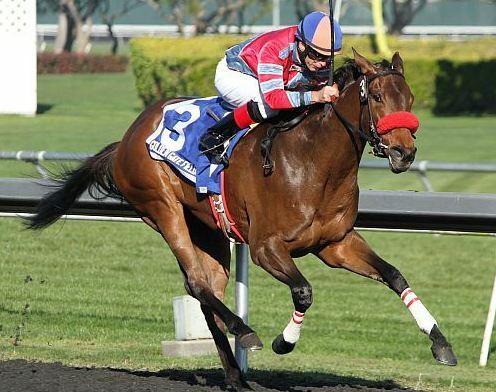 He was going to run in a non-graded stakes race in New York last month, but it was cancelled due to high winds. Mr Speaker is a very handsome boy, he has a very proud and strong stance. PTG, thank you for sharing. I agree with Horselover24....very sweet. Thanks for sharing the info. I was a big fan of Wait a While and now I can follow her through her progeny. He looks so much like his dam and I read that Pletcher really adored her and kept up with her as a broodmare, so I'm sure he'll take good care of him. i was able to see this race happen live today on TVG and let me tell you, it was as impressive as everyone is saying. Hes unbeaten in 3 starts now with claims that no one was close to him when he won. his pedigree: Sire is Noble Causeway, Dam is Little Indian Girl by Indian Charlie. Samraat. His pedigree: Sire is Noble Causeway, Dam is Little Indian Girl by Indian Charlie. Is that name pronounced SAM RAT? Good grief. What's the story behind that name? I don't know what's worse Samraat or Youremysugardaddy. C.W. Anderson has a chapter in one of his books titled "Give a Boy a Good Name." I am going to have to find it and reprint here at the blog, lol.